Some of you might think that title is strange, but my fellow introverts will understand. The hours of mental preparation that go into making a two minute phone call. The sense of dread when the phone rings and you aren’t ready to talk with someone. The pressure of sounding engaged and alert while thinking fast enough to avoid awkward silences. 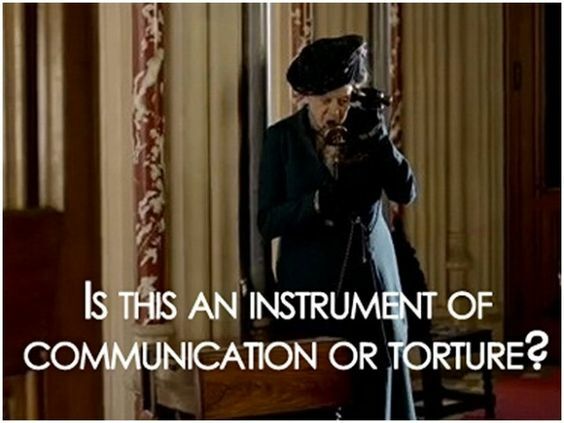 Most of us view the telephone in much the same way the Dowager Countess of Grantham does. But I had a truly enjoyable phone conversation with a friend this weekend, and I realized this wasn’t an isolated incident. When he asked for my number my first instinct was panic, then I realized there wasn’t any reason to. I talk with my sister on the phone for hours almost every day. I chat with my dance team when we’re coordinating practice times. I enjoy the unexpected call from my cousin or a select group of friends. Chatting on the phone really isn’t all that scary. Now, in the interest of full disclosure, I am in many ways a stereotypical introvert in regards to the telephone. We don’t have caller ID on the landline and the calls are rarely for me, so I refuse to answer when it rings unless I recognize the voice and want to talk with them now. My cell phone is set so it doesn’t even ring unless the number is in my contacts list and, in general, I much prefer written communication. There are times, however, when telephones are a preferable method of communication. For business communication, e-mail is the best thing ever invented. It’s in writing and both you and the recipient can deal with it in your own time. No worries about coordinating schedules or about mis-remembering the communication. It’s perfect. That’s my feelings on things like making appointments as well (I absolutely love my current hair salon — you can make appointments via e-mail! y’all feel free to be jealous). If you’re communicating with a friend, though, there are times when you need to ask a question too complicated for text message and it’s just simpler to try and call. And there are times when you just want to talk with them, hear their voice, and enjoy the instant back-and-forth of a verbal conversation without driving hours to connect in-person. Perhaps you acknowledge that phone calls are at times necessary, even a good idea, but still don’t like them. I totally get it. Even if you want to talk with someone, there are still times the phone triggers your social anxiety or inner hermit and you just wish it’d had never been invented. So here are a few tips for making phone calls better. You’re under no obligation to answer calls from random, unknown numbers. Use that caller ID. If you want to talk with the person on the other end or think it might be important, pick up. If you need a moment, let it go to voice-mail and then decide how soon you need to call them back. For calls that you have to make (the ones to people you don’t want to talk with), there’s no shame in writing out a plan. I jot down a list of things I need to talk about or ask before calling doctors, auto mechanics, and all sorts of other people. If phone calls really worry you, you can even do this for calls with friends. Just make a couple notes of conversion starters to use in case of awkward silence. There’s always something you could be doing other than talk on the phone. If you decide to answer a call you don’t want to last very long, just say right up front, “I only have about ___ minutes to talk.” Or if you’ve been talking for a while already, it’s perfectly okay to say, “Well, I have to go. It was nice catching up with you!” This is just a basic healthy boundaries tip: you have the right to politely leave a conversation when you don’t want to talk any more for whatever reason (your introvert batteries are draining, you need to make dinner, etc.). People who like to talk will keep a conversation going. Take ENFPs for example. I’ve never had an awkward silence in a conversation with them, nor have the conversations become boring. If you’re working on building confidence when talking on the phone, call one of your extrovert friends. What are your thoughts on telephones? Do you have any tips to make telephone conversations easier? 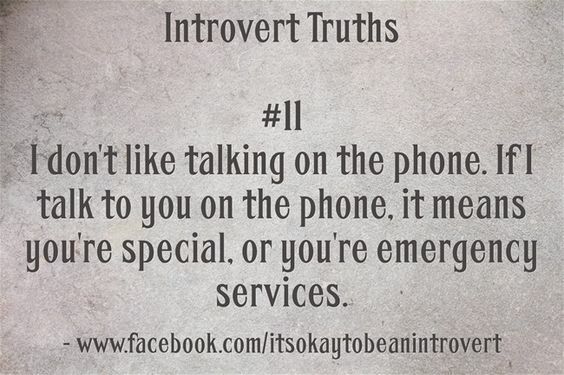 I developed a special hatred for phones during a phone job especially unsuited for HSP introverts with ADD. Along with the lighting, dust, general noise and other atmospheric bothers, pretty sure I had a mild panic attack at all loud, electronic sounds for even a year afterward, which became a nightmare for my mother as I planned my wedding. Alarms, text messages, and phone calls all got my heart racing like I was under threat of attack. Unfortunately, I had no idea I had ADD that bad until recently, and I also didn’t know about HSPs until toward the end. 1) Silent: I assign no special ringtone. These are callers who I may not care to talk to, and I don’t really need to talk to right away, like old school friends that I am not dying to hear from. So they just ring through like everybody else. 2) Quiet: I assign a calm and soothing ringtone – might be rather quiet. These are people like my mom, who I may or may not be ready to talk to. Sometimes I might be happy to pick up the phone, sometimes I might need to pick up the phone whether I want to or not, and sometimes I might just want to be aware that she called. Friends who I care about but find more difficult to talk to end up here as well. 3) Noisy: I assign a semi-energetic ringtone, but still something fairly calming (think old Owl City music, or a cheerful folk song). These people tend to stress me out less and aren’t scary to talk to, plus they might just not call often. My dad and my husband are on this list, because although I might not always be excited about what they have to say, neither call often and both generally make me feel calm. -Some personalities are more complimentary than others. I’ve found that Js make me feel most at ease, probably because as a rambling NP with ADD and decent Fe, I can carry the conversation with minimal assistance (though I probably repeat myself after a while if the other party doesn’t participate enough). Generally, the calm, steady approach of judging types is simpler for me to follow and creates an atmosphere of peace so I can think. IPs are also okay, but EPs tend to expect more out of me than I have I think, because my Ne fools them into thinking I am more extroverted. -I like people who don’t talk for long, but I ruin that for myself a lot because of the ADD/Ne. And on rare occasion with certain people, I want to talk more (Fe). -I turn down the ringtone volume so it isn’t as surprising. -If I really don’t want to answer a call right away, I push the hang up button once, which allows it to silently “ring” until the voicemail picks it up. -I sometimes write things down before making calls. -Meditating/praying for a second during an obnoxious bout of stress over nothing. -My voicemail says, “Hi, you’ve reached Meredith. 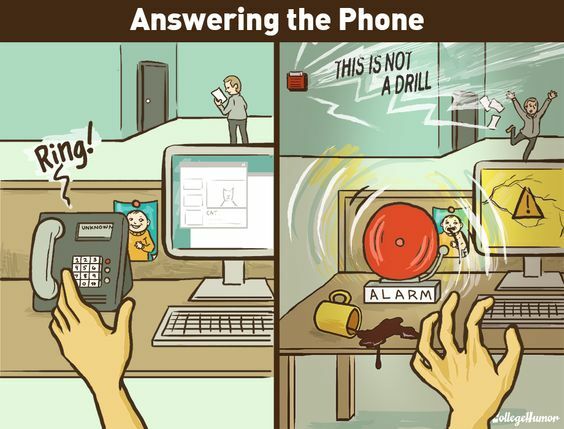 I avoid phone calls like the plague, but I will listen to a voicemail if you leave it after the beep.” I think it helps people to know that it is a fairly generalized problem and that I am not necessarily avoiding them as a person. – I use “do not disturb” to my advantage. I can manually turn it on or off whenever, but I also have it off after 10pm, and because I hate sounds in the morning, it stays on until 11am. Yes, 13 hours of peace. But in case of emergencies, some people like my mom and husband can still reach me by calling twice in 3 minutes. -I usually only make phone calls in the afternoon, when I am most awake. And my hair person takes appointments by text! Ugh, I can’t imagine being in a phone job like that. Sounds terrible. Don’t blame you one bit for hating the phone! But those are great tips for dealing with calls. I love your voicemail message! My thoughts on phone conversations have changed over the past year. I used to dread talking in the phone (unless it was with my very extroverted sister), much how I dreaded any sort of small talk. However, a little more than a year ago, I began to learn what identity in Christ really means. Because I am secure in my identity, I am much less afraid of conversing with people I don’t know well. I know that my “performance” in small talk does not define who I am, and so now I am more free and relaxed when conversing. And something I’ve learned about those dreaded awkward pauses (which happen frequently when I’m conversing), I’ve learned that they bothered me because of my pride. I wanted others to think of me as being intelligent and eloquent; awkward pauses, I thought, would communicate the opposite. Often in a conversational lapse, because I saw those as something to be avoided, I would then resort to filling the gap with some stupid statement; and that was worse than the lull. I still struggle to converse with strangers and people I don’t know well, but those situations have improved. God, who is greater than the most skilled human, loves me unconditionally. He gave me my extremely introverted personality, and He is with me as I fumble my thoughts in conversations, reminding me who I am, as well as that the person with whom I am engaging was created in His image and is worthy of my time and attention. Thank you, again. I love your blog.